Literature and ideal romantic partners cannot be discussed without mentioning at least one character from a Jane Austen novel. Thus I continue my exploration of worthy literary gentlemen by choosing my favorite Austen hero. No, it's not Mr. Darcy. While I admire a lot about Mr. Darcy and I completely understand why many ladies have fallen hopelessly in love with his fictional character, I find myself admiring another Austen hero: Mr. Knightley. Mr. Knightley appears in Austen's fourth novel, Emma, alongside the exuberant Emma Woodhouse. The novel's plot can be summed up as Mr. Knightley chasing Emma around while she tries to match-make and improve the lives of every person she interacts with, often with questionable success. Over the years, a number of adaptations of Emma have been released with slightly different portrayals of Mr. Knightley's character. No matter which adaptation, Mr. Knightley remains my favorite Austen hero. If I loved him less, I might be able to talk about him more. But for now, these reasons will have to suffice. Throughout the novel, Mr. Knightley is Emma's confidant. They discuss a lot of the social interactions in their lives, and Mr. Knightley is always willing to freely give his opinion. He's open about how he believes Emma's friendship with Harriet Smith will turn out: "'I have always thought it a very foolish intimacy,' said Mr Knightley presently, 'though I have kept my thoughts to myself; but I now perceive that it will be a very unfortunate one for Harriet'" (Emma, 61). He can easily give his opinion about why Emma dislikes Jane Fairfax (160), what he thinks of Frank Churchill's handwriting (289), and even his own misjudgment of Frank Churchill (414). His open and honest demeanor allows for him to be straightforward when it comes to Emma and the many relationships she tries to influence. He is also very careful in how he uses his honesty; he doesn't always say everything that comes to mind--unlike Emma--but he's careful with his words (341-42). This also influences how he is perceived by others. His honesty gives him a reputation of a real gentleman: "You might not see one in a hundred with gentleman so plainly written as in Mr Knightley" (30). Even Emma admits that Mr. Knightley would never do anything to lead a woman on, and he would always show integrity in his relationships. In relation to his honesty, Mr. Knightley consistently shows respect to every person he interacts with. He's always polite, he shows kindness to people of all classes, and he makes sure everybody is taken care of. All of his actions reinforce his gentlemanly reputation through kindness and consideration. From the beginning, he is considerate by stopping in at Hartfield to visit with Emma and her father. He is described as "having a cheerful manner which always did him good" (7). Continually, he makes accommodations for Mr. Woodhouse, so he is comfortable and entertained. He even goes so far as to agree to stay at Hartfield after he and Emma marry in order to keep Mr. Woodhouse happy: "that so long as her father's happiness--in other words his life--required Hartfield to continue her home, it should be his likewise." (436). Mr. Knightley also shows kindness toward people of other classes or those who don't have high reputations in their society. He does not shy away from vocalizing his high opinion of Mr. Martin, despite their class differences: "I never hear better sense from any one than Robert Martin...He is an excellent young man, both as son and brother" (56). In addition, he goes out of his way to help Miss Bates and Jane Fairfax so they are not excluded from the social gatherings. When it's revealed he had his carriage bring Miss Bates and Jane to and from the event, Emma is hardly surprised because his reputation proceeds him. Mr. Knightley is the one they depend upon to act with kindness. Mr. Knightley's kindheartedness flows into his treatment of the ladies in his social circle. He is always looking out for Jane Fairfax, Harriet Smith, Miss Bates, and of course, Emma. When Frank Churchill makes Jane Fairfax play song after song, Mr. Knightley gets angry, something he seldom does throughout the book: "'That fella,' said he indignantly, 'thinks of nothing but shewing off his own voice. This must not be'" (222). He immediately calls for action to give Jane a rest so she doesn't overexert herself. He saves Harries from embarrassment after Mr. Elton refused to dance with her by taking her to dance--something he seldom does and even refuses to do earlier (319). This action protected Harriet's reputation and fortified his own reputation as a true gentleman (unlike Mr. Elton). During an outing to Box Hill, Mr. Knightley looked after Miss Bates and Jane Fairfax since they didn't have escorts (357). He also comes to Miss Bates' defense when Emma offends her (361). But most of what he does is for Emma's benefit. He does what he can to protect Emma from others--even herself. He openly gives his opinion of Mr. Elton, Frank Churchill, and even Jane to help Emma see more clearly the people she surrounds herself with. When he learns Frank is engaged to Jane, he rushes back to Emma in order to comfort her, believing she is in love with Frank. When he learns that is not the case, he has the opportunity to share his true feelings with her, which reveal his protective love of her and the reason behind everything he has done. Mr. Knightley's honesty, kindness, and protectiveness make him a dependable and trustworthy presence for the Woodhouses and their acquaintances. Over and over, he shows his dependability, whether it's assisting Mr. Woodhouse with the door or making sure everybody is included in the plans. He is a constant and steadfast presence in Emma's life and has been since she was a young girl. Many others--Mr. Elton, Frank Churchill, Mrs. Weston, and even Isabella Knightley--come and go throughout Emma's life. Mr. Knightley is the one person she can depend upon for honesty and kindness: "Mr Knightley, a sensible man... a very old and intimate friend" (7). 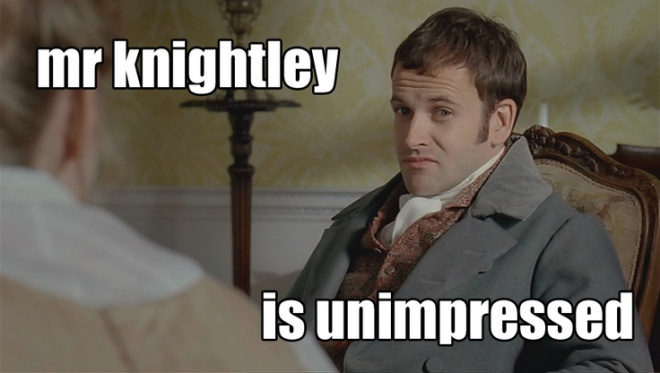 Mr. Knightley is depended upon during social outings as a voice of reason and person to trust. He is the one who checks to make sure it's safe to travel home and he helps Mr. Woodhouse first and foremost: "Mr Woodhouse, always the first object on such occasions was carefully attended to his own by Mr Knightley and Mr Weston" (123). He makes sure Miss Bates is taken care of as well. Again, his actions come as no surprise to anybody who knows him. They would expect him to be there to help in a time of need because of his honest and kindhearted nature influencing his actions and words. His reputation, once more, is fashioned by these actions. All of these traits stem from Mr. Knightley's model of good sense. He is the unwavering voice of reason for Emma throughout the novel. He shares his honest opinions in a gentle, kindhearted manner in order to protect those around him with his perceptiveness. He can see Emma outside of her own head in order to help her become a better person. He gently corrects her actions because he notices them and because she trusts him: "Mr. Knightley, in fact, was one of the few people who could see faults in Emma Woodhouse, and the only one who ever told her of them" (8). Emma doesn't always listen to his advice or opinions, but more often than not, his words are true. After the ordeal with Mr. Elton, Emma thinks back on what Mr. Knightley told her and realizes he was correct: "the caution he had given, the conviction he'd had professed that Mr Elton would never marry indiscreetly" (131). This moment gives her pause, and while she makes more blunders later, it's the beginning of her maturity. Frequently, Mr. Knightley corrects Emma when she makes poor decisions, but he does it gently with consideration and kindness. He does not want Emma to get hurt, but he wants her to learn her faults have consequences, such as when she offends Miss Bates. It's this moment that Emma learns that her actions do have consequences. She must live with what she said and how it affected her relationships; she must come to terms and learn to make amends. In addition, Mr. Knightley's intuition helps him maneuver Emma's frivolous actions. He dislikes Frank out of jealousy but also because he suspected "him of double dealing in his pursuits with Emma... began to suspect him of some inclination to trifle with Jane Fairfax" (334). He believes there is something else going on with Frank and Jane, though he isn't sure what it is. He turns out to be correct when it's revealed Jane and Frank had been secretly engaged! His intuition about Mr. Elton came to pass as well as did his thoughts on Harriet and her status. As always, Mr. Knightley's gentle correction and guidance stem from his love for Emma. He wants to help her be the person he knows she can be. No one else--not Mrs. Weston, not Mr. Woodhouse, not Frank Churchill--show this dedication and love in the novel. Mr. Knightley is a true gentleman for sensing Emma's potential and acting in such a way for her to reach that potential. 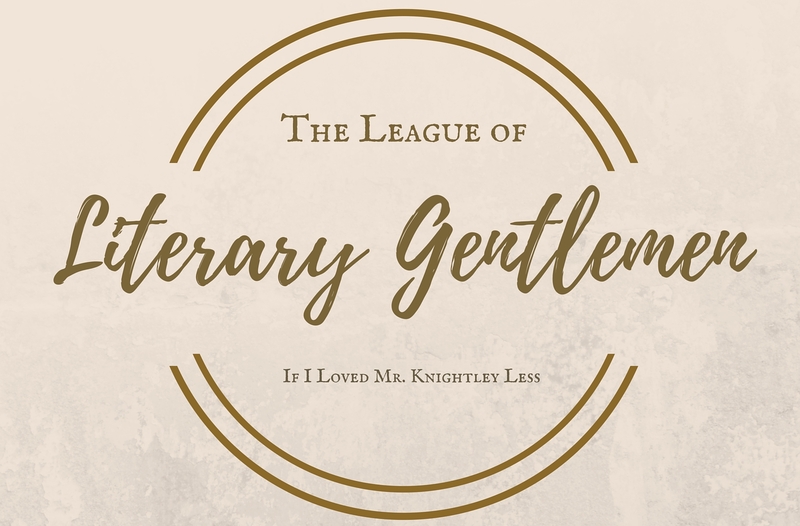 Mr. Knightley might not be the cryptic, handsome, and rich guy at the party, but he has plenty of genuine qualities to make him worth admiring. His down-to-earth nature alongside his sweet declaration of love fuel Mr. Knightley's character, but there is much more to his character than kindness and serenity. His actions reinforce his status as a gentleman and his compassion as a person. All quotes were taken from 2010 edition of Emma by Jane Austen published by Harper Press. Emma was originally published in 1815.